NETWORK UPDATE: AMERICAN IDOL, THE BIG BANG THEORY, 2 1/2 MEN and ELEMENTARY all found an extra 0.1 in final ratings. MOM (which probably started at 8:31PM) and the HOW TO GET AWAY WITH MURDER rerun each lost 0.1. ARCHER (FX) returned to Thursday cable at 0.77, It was followed by PAWN STARS (History), at 0.71/0.66 in its two half-hours, with PAWNOGRAPHY at 0.54/0.50. TNT’s NBA doubleheader was at 0.62/0.61. MTV’s RIDICULOUSNESS also aired two episodes, at twin 0.52s (up from last week’s 0.48/0.46), with lead-in ROB DRYDEK FANTASY FACTORY steady at 0.42. THE FIRST 48 (A&E) was at 0.62. 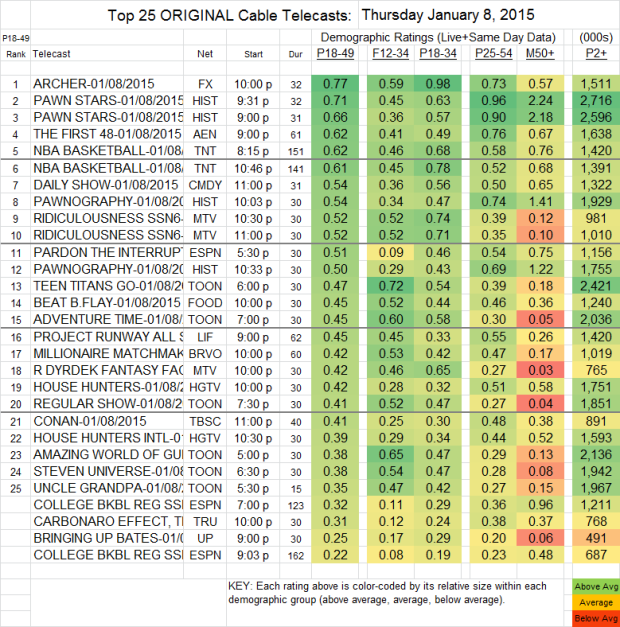 PROJECT RUNWAY ALL STARS (Lifetime) was at 0.45, and MILLIONAIRE MATCHMAKER (Bravo) was at 0.42, up 0.11 from last week. Not on the chart: the BABYLON premiere on Sundance: 91,000 persons 2+ and 0.009 adult 18-49 rating.